There are about 700 inhabitants in Emyvale village. An iron sculpture of Three Ducks at the Northern approach road represents the industrial aspect of life in the area, while the iron sculpture of a Fisherman at the Southern approach represents the social life. Silverhill Duck Farm is the nearest industry to the village. Mushrooms and dairy are major farming industries in the area. Fishing is a major social activity with all the local lakes abounding in fish. Emy Lake is a Trout Fishery and also attracts many swimmers during the summer months. Walking has become a very popular past-time and special routes have been developed around the area. Donagh Development Association developed a walk-way around the Lake and this is a wonderful amenity for walkers. Emyvale Leisure Centre was built on the site of an 1836 Primitive Wesleyan Methodist Mission House. 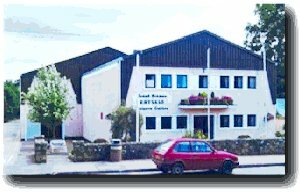 It was later a commercial Ballroom, known as ‘Benny’s Hall’ (owner was Benny McMahon) and it was then purchased by Donagh Parish and became the Donagh Parochial Centre. This was demolished to make way for the new Centre. During demolition the name stone of the Mission House was discovered under the floor and this was erected on a plinth in front of the new Centre. Work began in 1981 and the Centre opened in May 1985. A committee of 20 locals raised over £300,000 in that time to ensure that the Centre opened clear of debt. Most of the work was carried out through ANCO with Harry Doherty as Foreman. Harry passed away on January 3rd 2001. The facilities are totally utilised especially through the winter and spring nights. On Thursday of each week the North Monaghan Social Services Committee, a voluntary organisation, hold a Senior Citizens session in the Centre. Over 60 citizens are given a delightful meal, entertained and given medical care and advice. From DPC to Leisure Centre. A look back in time HERE..